I like how it says "Writer." I attended the SCBWI Europolitan writer-illustrator conference in Paris at the end of March. It was amazing. 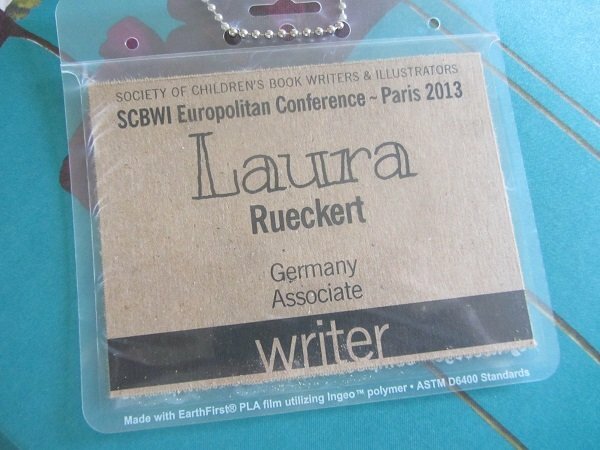 If you write kidlit, I strongly recommend going to an SCBWI conference someday. Author Sara Grant gave a two-hour knowledge-packed class on revising. Author Amy Plum taught world-building, gave tips on self-marketing and critiqued my manuscript (yay!). Writer/Actress Sandra Nickel held a workshop on showing character's feelings. Agent Jennifer Laughran gave feedback on pitching (including praising my pitch!) and proved you can be on a panel and participate in social media at the same time. Author Anne Nesbet not only gave great tips, but an inspirational speech at the end of the conference. There was so much information and emotion, so many nice people from all over the world as in love with reading and writing as I am. At the conference, I was a sponge, soaking everything up. Now that I'm home, I'm finally processing it all. Since I was in the conference from morning until evening and there wasn't much time for sightseeing, my impressions of Paris are different from a normal vacation trip. Oh, and sorry for the poor picture quality. I really need a new cell phone with a better camera. My hotel was right next door to the Jaguar dealership. So, not a bad part of town, huh? The metro (subway) is above ground where I stayed. The FFF (French soccer federation) is just down the street, and I munched croissants with an employee one morning in the hotel's breakfast room. I probably only noticed the building because I work for a sporting goods company and the soccer World Cup is the biggest deal in Germany. View from my hotel room. The Eiffel Tower must be just behind those buildings. Really. I liked the paintings on this former dairy shop near the conference. Okay, so there isn't much touristy in this blog, but I did manage to get to the Eiffel Tower after the final conference session ended. Interestingly enough, there was a bomb threat about 30 minutes after I left the Eiffel Tower and 1400 people had to be evacuated. Glad I got to see the Eiffel Tower. And glad I missed the evacuation. And so, so glad I went to the conference. Did anyone else attend? What did you think?